Powers/Abilities: As a zombie, Zombie possesses typical heightened durability common to his type. Unlike some other zombies, he does not require human flesh for sustenance and has retained his intelligence and speaking ability. He is skilled in high-tech firearms. 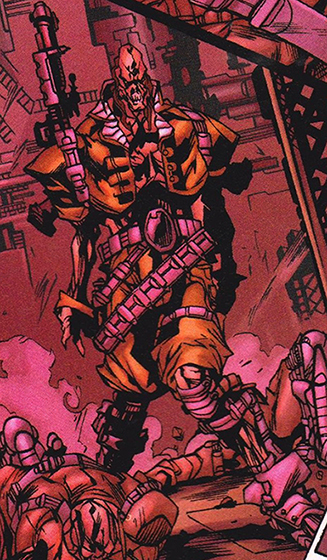 History: (Nick Fury's Howling Commandos#1) - Zombie took part in a Howling Commandos strike against a Lords of the Living Lightning base located in Afghanistan. 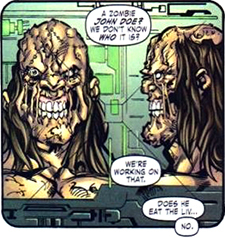 As the other Commandos battled LLL agents, Zombie located two technicians and forced them to purge their computer systems by bluff, claiming he would eat them if they didn't. (Nick Fury's Howling Commandos#2) - In the Area 13 commissary, Living Mummy and Vampire By Night were discussing Merlin's escape from captivity. Zombie asked to sit with them, but Living Mummy rebuffed him. After the Mummy left, Zombie again asked to sit at the table, to Vampire by Night's annoyance. (Nick Fury's Howling Commandos#4 - BTS) - Zombie was in Area 13 when Merlin's army opened a portal into it and invaded. (Nick Fury's Howling Commandos#5) - Zombie and the main Commandos unit infiltrated the portal after sending a group of rampaging giant monsters loose to drive Merlin's forces back through it. On the other side (a magically transformed UK), they found one of the giant monsters, Groot, who offered to join them and help. They soon located their team member Vampire by Night, who had been working undercover within Merlin's army. (Nick Fury's Howling Commandos#6) - The Commandos arrived at Merlin's base, where they were joined by other Commando monster units as well as the Mole Man. They launched a massive assault on Merlin's forces and when Merlin was tricked by Lilith into believing he was destined to lose the battle, he fled, allowing the transformed countryside to return to normal. It was made clear in the series that this was not Simon Garth. Of all the main team members, we see the least of Zombie (he's not even on any of the covers), and it's made clear in the books several of his teammates think very little of him. Unfortunately, few full-body images of Zombie exist, so I had to go with one with him in a red-tinted room.